Villa-Lobos’s Five Preludes of 1940 – the first of which is heard here – followed on from the Twelve Studies that the composer wrote expressly for Segovia after their first meeting in Paris in the 1920s. “Here Villa-Lobos treats the guitar as if it were a cello – the melody is in the bass, rich, sustained and legato. It sounds as if you would need a bow to play it with! It is one of the best-loved pieces from the guitar repertoire and one that I have performed for many years.” The “Mazurka-Chôro”, in contrast, dates back to an earlier stage in the composer’s developing style, to the Suite popular brasileira of 1912, in which Villa-Lobos merges the “chôro” of Brazilian street musicians with European dances. Nothing could be closer to the people than the music that almost defines this world – the tango. For Miloš, the choice is obvious: “Is there anyone in this world who doesn’t like tango? It’s the most beautiful, sensual, erotically-charged dance on the planet and, as such, an essential ingredient for this disc.” The style itself is almost defined by the swooning, seductive Por una cabeza by the “King of Tango”, Carlos Gardel, written in 1935, the year of his tragically early death. Familiar from a host of films, not least the 1992 drama Scent of a Woman, it vies with La cumparsita, composed by the Uruguayan Gerardo Matos Rodríguez in 1917, for the honour of being the tango melody par excellence. The two pieces by Astor Piazzolla, Oblivion and Libertango, are equally classics of the groundbreaking tango nuevo, the more inclusive and evolved style that the Argentine composer developed from the 1950s onwards and that brought him an international audience. 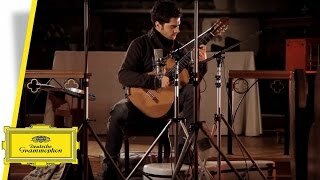 As Miloš remembers, “When I was a student at the Royal Academy, everyone was totally mad about Piazzolla, perhaps because his music felt like an escape from the rigours of classical training.” One tango not by a Latin American, but by the French-Tunisian guitarist and composer Roland Dyens, is Tango en skaï: “It is a very cool piece, and I’ve been playing it for many years as an encore in recitals. For me it epitomizes joy.” An arrangement of the Cuban Osvaldo Farrés’s 1947 hit, and a Latin standard, Quizás, quizás, quizás, brings an even more popular note. The contemporary Argentine composer Jorge Cardoso made his own musical travelogue of Latin America in his 24 Piezas sudamericanas, which ends up in Uruguay with a “Milonga” – an evocation of the precursor to the tango. Here, and in Un día de noviembre by prolific Cuban composer Leo Brouwer, Miloš considers it important “to capture the depth and meaning of the music with simple shapes and forms – where every note is able to reach deep into the psyche of the listener, where the guitar becomes a voice”. One unifying feature of this music for Miloš is its directness: “Latin American guitar music is perhaps even more uninhibited than Spanish.” The point is borne out by the Uruguayan-born Brazilian composer Isaías Sávio’s Batucada, which takes the popular samba style of the Rio favelas and turns it into an uncomplicated, pulsating guitar showpiece, as also by the Argentine-born Jorge Morel’s springy, energetic Danza brasilera, “which”, Miloš admits, “always makes me want to dance to the beat”.